The piping plover (Charadrius melodus) is a small shore bird that breeds in three distinct geographic locations; the beaches along the Atlantic coast, the shorelines of the Great Lakes, and along major rivers of the northern Great Plains. The Great Lakes population is classified as endangered by the U.S. Fish and Wildlife Service; the other two populations are classified as threatened. At one point, this population of Great Lakes piping plovers was estimated to range from 12 to 32 breeding pairs. After extensive observation, scientists found that plover nests were abandoned and concluded that salvaging these abandoned eggs could contribute to the species’ recovery. 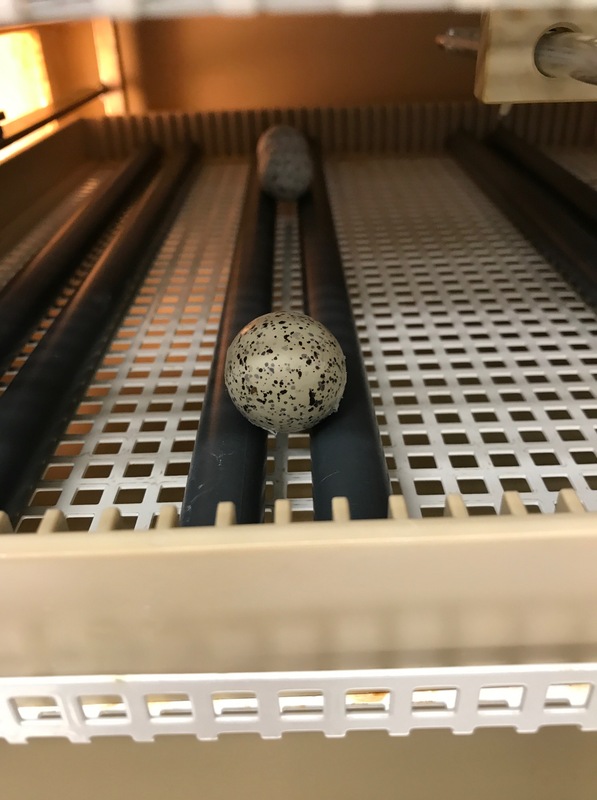 For almost two decades, the Detroit Zoological Society (DZS) has led the effort to collect these abandoned eggs, incubate them and rear the chicks that hatch until they can be released to join wild plovers. 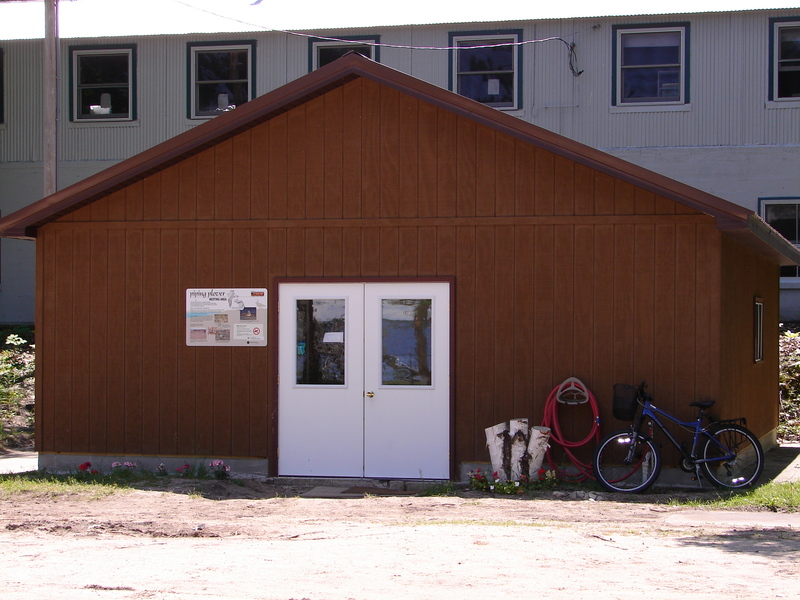 The DZS operates the captive rearing facility at the University of Michigan Biological Station in Pellston, Mich., and oversees aviculturists from the Detroit Zoo and other Association of Zoos & Aquariums institutions who staff the facility from May through August. The dedicated zookeepers monitor the eggs during incubation and care for the chicks after they hatch. Once they are able to fly, after about four weeks, the birds – that would have otherwise perished – are banded and released into the wild. As they migrate to their wintering grounds, the plovers are identified by birders and photographers who report their findings to the U.S. Fish and Wildlife Service. I spent five weeks this summer at the captive rearing center, working with what I believe are some of the cutest chicks in the world. While our conservation efforts have been incredibly successful over the last 17 years, the Great Lakes piping plover population is still less than 80 breeding pairs annually. This year, seven DZS zookeepers and 12 staff members from eight other zoos helped raise 16 chicks from abandoned eggs to join the more than 90 chicks that wild birds raised. Adult piping plovers tend to breed around the shores of the Great Lakes on large patches of undisturbed sandy beach filled with cobble. Sometimes, their nests are washed out by waves, a parent is killed by a predator, or an unleashed dog causes abandonment. These nests are closely monitored and when staff has determined that the eggs are not being incubated, they are officially declared abandoned and the eggs are transferred to the captive rearing center. In some cases, such as when a storm is passing through, “dummy” eggs will be placed in the nest while the real eggs are placed in an incubator overnight and then returned the next day. The captive rearing center has multiple incubators and equipment to nurture each egg and provide the conditions it needs to develop a healthy embryo. 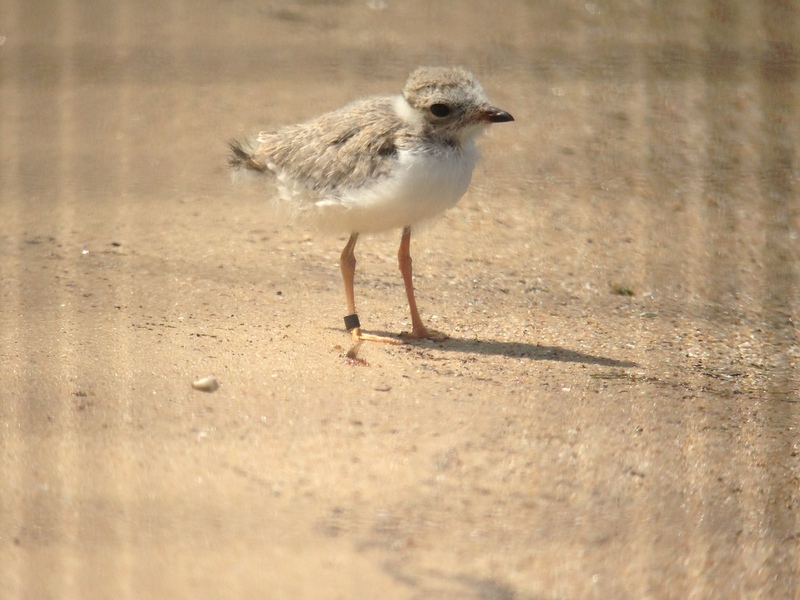 After almost four weeks in the egg, a little plover chick will spend two to four days hatching. Newly hatched chicks weigh about as much as three pennies yet are very mobile, looking for food within a few hours of hatching. When a full clutch of four chicks hatches, it looks like four cotton balls on eight toothpicks running around. 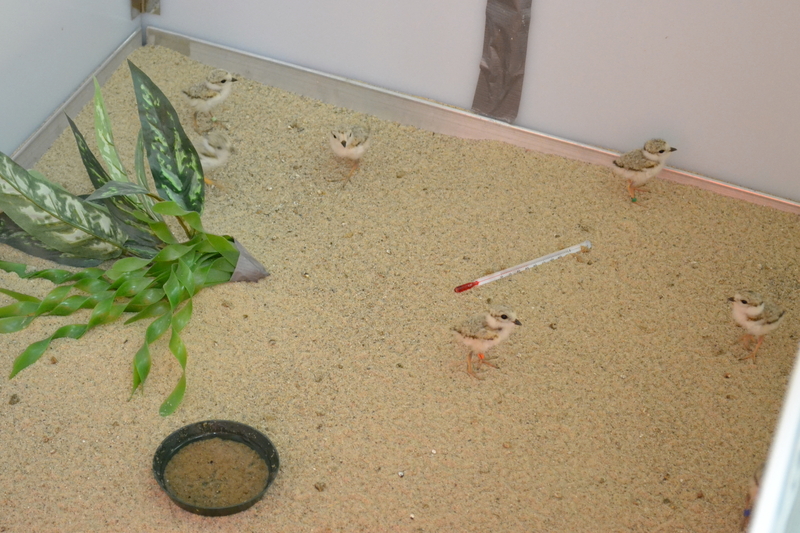 Rearing plover chicks properly and assuring they will be ready for release is no easy task. We weigh the chicks every morning and observe them to make sure each bird is thriving. Bonnie Van Dam, the DZS’s associate curator of birds and manager of the captive rearing operations, fields any questions from staff. One chick in particular needed a little more help from staff this year as it had difficulty hatching, curved toes, bowed legs and some feather abnormalities (genetic issues that can’t be avoided), but zookeepers did not give up on this little chick, providing antibiotics, extra feeds and extra practice flying. In the end, although a little different, this bird had incredible character running around and flying well. We routinely feed the birds a variety of insects every few hours while they also learn to forage on wild insects. They grow fast and their flight feathers start coming in within two weeks. At 17 or 18 days old, the piping plovers are starting to stretch their wings and by 25-27 days they should be flying well. We have one flight pen along the beach where the plovers grow, forage and learn natural behaviors; another is attached to our building to give them outdoor access overnight and more space to practice flying. 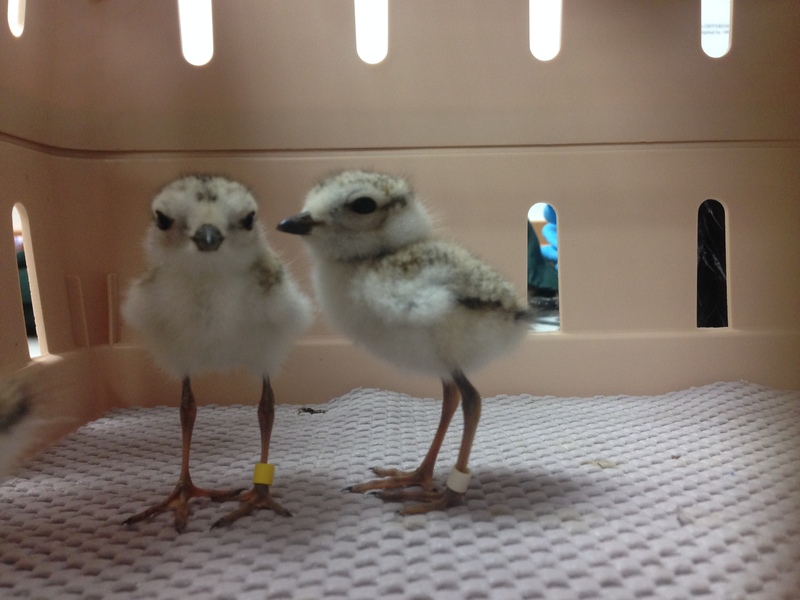 Plover fledglings are usually released between 28 and 33 days old. This year we reared 16 chicks that were released into the wild. Most releases occur in an area where there are similarly aged wild chicks; often the releases happen at Sleeping Bear Dunes. It is an incredible feeling opening the door to the crate and letting these small chicks fly free. They immediately start foraging, bathing and or flying around. With a little luck and some decent wind, they will make it to the Atlantic coast or maybe even the Bahamas, enjoy winter, and return to northern Michigan next spring. On August 14, we released the final four birds of the season at Sleeping Bear Dunes, including the special little chick who needed all the extra help. This bird ran down the beach and almost immediately started flying! Each piping plover is a special part of our Great Lakes ecosystem – please be mindful as you share the beaches with these charismatic yet fragile friends. – Matthew Porter is a bird department zookeeper for the Detroit Zoological Society.